Clinicians, coaches and trainers all share the same goal: getting the human body to function at its peak with minimum risk of injury. Yet, two major problems often hold these professions back from achieving this shared goal. Healthcare and fitness practitioners often neglect fundamental movement, paying too much attention to the surface view. A surgeon, a physician and a physical therapist see problems through eyes biased by their training. One sees a surgical solution based on structure; one considers which medication to manage pain and inflammation, while the other looks for mechanical issues to rehabilitate. Coaches and trainers, on the other hand, often focus on fitness and performance without first screening for movement dysfunctions that might cause movement compromises or predispositions to injury. Across these professions, fundamental movement often isn’t brought into the conversation on the same level as other issues that are qualified and quantified in exercise and rehabilitation. This leaves people open to risk of injury, pain and performance inefficiencies that could otherwise be avoided. Coaches, trainers and clinicians have different skillsets, different areas of expertise, and different educational backgrounds. But because they treat the same clients, they must be able to effectively communicate with each other. In the absence of a common language, these different professions often speak past each other to the detriment of the client. If you’re a trainer, strength coach, physical therapist, or chiropractor whose clients trust to get them performing at their best, you need to have a system for evaluating and improving movement quality and a language to communicate with other professionals in. In Movement, Gray outlines the movement system that is aimed at solving these problems. A system that is now being used across the world in NFL teams, NHL teams, the military, universities, and countless other clinics and training centers. This system gives you a standard operating procedure and common language for movement-pattern screening, assessment and correction in fitness and rehabilitation. It will allow you to better identify potential risks and create better rehabilitation and exercise programs based on each individual’s unique movement profile. “Exercise and rehabilitation time is valuable—too valuable not to use a system. Movement is like the college course in the ‘missing piece’ of the performance and rehabilitation puzzle you never learned in school. “Once a decade a book comes out that you will keep reading, rereading, and crowding with notes until it falls apart. Then you buy a new copy and enthusiastically start over. ~ Pavel Tsatsouline, author of Enter the Kettlebell! 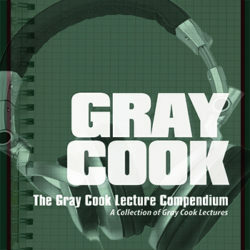 “Gray Cook has the ability and charisma to reach any audience. A WhizKid PT, Gray has singlehandedly changed coaching in every professional sport. You will learn how to use screening, testing and assessment to classify movement proficiency or deficiency. You’ll also learn the differences between the two systems, the Functional Movement Screen (FMS) and the Selective Functional Movement Assessment (SFMA). Where in your intake process should you screen? Can you screen an injured client or athlete? Movement will show you where to place movement screening in your existing business model, and where your program structure might be improved. What is the FMS? And how is it different from the SFMA? In Movement, you’ll learn about both the systems, and will finish with an appreciation of primitive and higher-level movement patterns. You’ll learn in detail the seven basic screens that make up the FMS, including where to stand during screening, what to watch for during the movements and how to plan your modifications. You’ll get a description of each screen, the purpose of each, tips for testing, possible causes of issues and photographs showing how to score each test. You’ll also learn how to modify the movement screen for special populations such as the morbidly obese, seniors and those with medical restrictions. You’ll learn how to analyze the various test results. Using the tests of the Functional Movement Screen as the base, you’ll discover what mistakes most beginners make in screening, how to distinguish between stability and mobility problems, and how to determine asymmetries. Here you’ll also get your first introduction to reverse patterning (RP) and reactive neuromuscular training (RNT), two of the primary corrective tools of the Functional Movement Systems arsenal. What do you do with the resulting screen and assessment information? You’ll learn about the performance pyramid and how to use it to form corrective strategies. Understanding the differences between correct and corrective exercises, between challenging versus difficult, and having a selection of self-limiting exercises in your exercise menu will give you confidence as you assign and program exercises. Now that you’ve discovered dysfunctional patterns in your clients, athletes and patients, learn how to develop the right corrective strategies with the help of the three primary categories of mobility, stability and movement-pattern retraining. You’ll get comparisons of conditioning and corrective exercise, movement prep and movement correction, skill training and corrective prioritization, and will understand when each is appropriate. You’ll get a six-item checklist for your corrective decisions. Even though every person’s movement is unique, with this framework, your corrective path will be clearer. You’ll also become familiar with the basic structure involving special considerations and populations that may make up part of your client or patient base. Build on your knowledge of basic mobility and stability corrections and movement-pattern retraining. Using passive, active and assistive techniques, you’ll be able to help your clients, athletes and patients recover lost mobility. Learn about stability and motor control, transitional postures and how to use facilitation techniques such as reactive neuromuscular training to challenge newfound mobility. Learn how to make corrective exercise an experience. This is how corrective exercise actually works in the human body, and the thorough discussion found in this chapter will teach you how to create this for your clientele. Using PNF, RNT, reverse patterning, conscious loading, resisted and self-limiting exercises, you’ll grasp the concept of the manageable mistake zone, and you’ll be able to use these ideas and techniques to stand out in your crowded professional field. Learn about the top-tier assessments of the SFMA, including the overlying considerations of functional versus dysfunctional and painful versus non-painful, the overriding criteria of the SFMA system. The SFMA breakouts are covered in detail over 58 pages and 66 photographs inside Movement. Understand the purpose of screening movement and learn how to recognize movement patterns in action. “Gray’s premise is beautiful in its simplicity: Training movement can fix muscles, but training muscles rarely fixes movement. Since all of sport is movement, his 80/20 approach is then astounding in its effectiveness. Inside you’ll discover a system that not only helps you screen and assess an individual’s movement quality, but also a system that helps you identify the corrective strategies they need to help protect from injury and to move better. “Gray Cook has changed things. You might not know it, but things are different now. I’ve been in sports since LBJ was in office, and I’ve been wondering something for a long time: What’s wrong? Yep, that’s it. Why does this hurt when I do that? How come I can’t just do X? Gray has the answer in his new book, Movement. “Right from the start, he tells me what I’ve been doing wrong for way too long: First move well, and then move often. His performance pyramid alone is worth the time and energy to read the book. But my favorite part of the text is idea of self-limiting activities. “It’s not a cure-all section, but, for me, it was a blueprint to think about exercise in a whole new light: something that actually moves while working on the quality of movement. If you understand what I wrote, bless you. Otherwise, read the section! “I keep expanding my ‘must have’ Library. Tommy Kono’s book? Check. Keys to Progress? Check. Boyle’s new book? Check. Cerutty on Training? Check. Power to the People and Return of the Kettlebell? Check and check. New Cook’s new book. This introductory chapter builds the foundation you’ll need to fully understand the purpose of screening movement. You’ll learn the concept of movement patterns and how to recognize these patterns in action, as well as the history and primary goals of movement screening. The next 16 pages expand on the differences between authentic movement and scientific anatomical function. The functional systems of muscles, joints and ligaments are covered, as are the fascial matrix, breathing and the neuromuscular network. Understanding movement deficiency and dysfunction and how these develop will illuminate your work, and clarify your explanations to your athletes, clients and patients. In Chapter 3, you’ll gain an appreciation of the natural laws of basic movement before specific, with an overview of how to use screening, testing and assessment to classify movement proficiency or deficiency. You’ll also get a summary of the differences between the two systems, the Functional Movement Screen (FMS) and the Selective Functional Movement Assessment (SFMA). Where in your intake process should you screen? Can you screen an injured client or athlete? This section will help you place movement screening in your existing business model, or it will show you where your program structure might be improved. This summary explains the differences between the two systems, the FMS for fitness professionals and strength coaches, and the SFMA for medical professionals. You’ll get a brief look at the systems, and finish with an appreciation of primitive and higher-level movement patterns. The chapter used to cover the FMS will teach you the seven basic screens in detail, including where to stand, what to watch for during the movements and how to plan your modifications. You’ll get a description of each screen, the purpose of each, tips for testing, implications and photographs showing how to score each test. 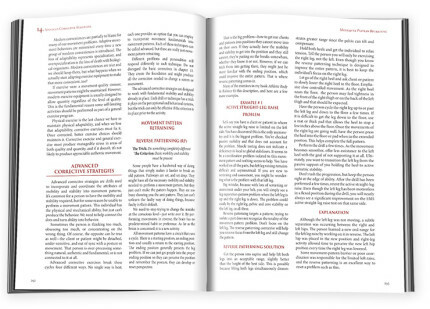 The top-tier assessments of the SFMA are covered in these 26 pages, which contain a discussion of the overlying considerations of functional versus dysfunctional and painful versus non-painful, the overriding criteria of the SFMA system. The seven elements of the top-tier will direct you to the breakout tests found in Chapter 8. Taking 58 pages and 66 photographs to cover the SFMA breakouts will serve to remind medical professionals of the individual assessments, and at the same time make fitness trainers and strength coaches aware of the tests used by professionals to whom they refer clients and athletes. The rationale for each of the breakout regions will pull the process together for you as it simplifies the overall approach. Chapter 9 teaches how to analyze the various test results. Using the tests of the Functional Movement Screen as the base, you’ll learn what mistakes most beginners make in screening, how to distinguish between stability and mobility problems and how to determine asymmetries. Here you’ll get your first introduction to reverse patterning (RP) and reactive neuromuscular training (RNT), two of the primary corrective tools of the Functional Movement Systems arsenal. This begins the wrap-up: What do you do with the resulting screen and assessment information? The 20 pages of Chapter 10 comprise the performance pyramid and how to use it to form your corrective strategies. Understanding the differences between correct and corrective exercises, between challenging versus difficult, and having a selection of self-limiting exercises in your exercise menu will give you confidence as you assign and program exercises. Now that you’ve discovered dysfunctional patterns in your clients, athletes and patients, the next section will guide you in the corrective decisions that make up the three primary categories of mobility, stability and movement pattern retraining. You’ll get comparisons of conditioning and corrective exercise, movement prep and movement correction, skill training and corrective prioritization, and understand when each is appropriate. This chapter provides a checklist for your corrective decisions: pain, purpose, posture, position, pattern and plan. Even though every person’s movement is unique, without this framework, your corrective path will not be as clear as it could be. You’ll also become familiar with the basic structure involving special considerations and populations that may make up part of your client or patient base. Chapter 13 builds on your knowledge of basic mobility and stability corrections and movement pattern retraining. Using passive, active and assistive techniques, you’ll be able to help your clients, athletes and patients recover lost mobility. Understanding stability and motor control, transitional postures and using facilitation techniques such as reactive neuromuscular training will give you the tools to challenge that new mobility. You’ll also become proficient at rolling after practicing the material in this rich chapter. Finally, in the 24 remarkable pages of Chapter 14, you’ll learn how to make corrective exercise an experience. This is how corrective exercise actually works in the human body, and the thorough discussion found in this chapter will teach you how to create this for your clientele. Using PNF, RNT, reverse patterning, conscious loading, resisted and self-limiting exercises, you’ll grasp the concept of the manageable mistake zone, and you’ll be able to use these ideas and techniques to stand out in your crowded professional field. This wrap-up section pulls the material together for one last review of where the industry is now, and where it’s heading. When you finish this section, you’ll have a complete understanding of the 10 principles of the Functional Movement System. These principles will guide you in learning and training authentic movement. While many people consider Gray Cook’s Movement a Functional Movement Screen book, it’s much more than that. After the introduction wherein Gray makes the case for screening and lays out the screens and assessments, the rest of the book covers movement correction—what to do with each screen’s information. You need to understand the corrective decisions that make up the three primary categories of mobility, stability and movement pattern retraining. You’ll also want to understand comparisons of conditioning versus corrective exercise, movement prep and movement correction, skill training and corrective prioritization, and understand when each is appropriate. Understanding the differences between correct and corrective exercises, between challenging versus difficult, and having a selection of self-limiting exercises in your exercise menu will give you confidence as you assign and program exercises. Is this book translated into Portuguese? I’m sorry that Movement is not yet in Portuguese. Thank you for checking with us. The application of the principles contained in this book has changed the lives of many people—real world people I see every day in my clinic. People who have suffered in pain for years now have their quality of life restored because of the applied principles in this book. Movement was a paradigm shift for me as a clinician. Gray opened my eyes to the wonders of human movement and the systems necessary for understanding it. This was the system I had been searching for when determining why people were getting injured, and why their pain syndromes kept returning. People asked, “Why does my pain keep coming back?” and I never had an answer. That is… until I discovered Movement. I was skeptical when Gray and Lee first took me through the screening process. But by bringing out my weak spots, this honest evaluation told them exactly what I needed to work on. They taught me to think of my body in a different way, proving trainers and therapists don’t need fancy equipment to do a good evaluation. I used the Functional Movement Screen in my work with training professional football players, and you can use it for your work with hearty athletes, personal training clients and rehabilitation patients as well. It’s that versatile, that effective and that appealing. Everything we did at the Indianapolis Colts is built on a Functional Movement Screen base—it’s the foundation of the program. We have integrated many of Gray Cook’s movement principles and corrective strategies into our programs to help accomplish our mission of preserving and maintaining the Commander’s combat power. The FMS screening and assessment tools are very useful in establishing the baseline for our performance training system. An excellent desktop resource. I found the text to be an effective mix of scientific rationale and practical application. Grey Cook’s Movement book has helped me to better understand and facilitate the Functional Movement Screen (FMS) and communicate it’s purpose and results with clients, patients, athletes and other practitioners. If you are looking to deepen your understanding of the FMS or Selective Functional Movement Assessment (SFMA) or to expand your horizons on human movement I recommend that you read this book. 30 years of coaching and personal training, this should have been the first book I read. It could have saved me years of figuring it all out. I have been a follower of FMS, Gray and Lee for quite some time. Their concepts and applications regarding movement make so much sense and address it differently than I had ever seen before. I use the FMS on a regular basis with clients and this book helps me to put it all together in my mind and more easily relay the info to others. I highly recommend it! I was studying exercise science but not really finding the answers to why so many people were suffering with dysfunctional joints. Amazon suggested this book to me and for that I am grateful. This book really started a conversation that I wasn’t hearing in class, what is functional movement and how to address it. I highly recommend this book to anyone who has a body and would like to understand how to use it better. The ebook edition includes the PDF, Kindle and epub files. The hardcover edition is no longer in print. The ebook is delivered instantly via download from a digital dashboard here on OTPbooks.com as soon as your order is placed.